The Axcess electric bike hunter comes in an 18″ step through frame, 26″ wheels with swept back handlebars; gears and controls at your finger tips as well as a throttle up to 4mph giving a comfortable and relaxed ride with a choice of a 10Ah battery or a 16Ah battery. The Axcess Electric bike Hunter combines comfort with practicality and durability. The thumb throttle on the Axcess electric bike hunter works up to 4mph, making it easy and safe to do a hill start or when pulling out into traffic. When pedalling you can use the throttle to overide the mode of assistance you are in, as it will instantly give you full power upto15.5mph. The moment you stop pedalling while using the throttle, the bike will slow to 4mph. The Hunter is fitted with the latest battery technology. The cells in the battery are manufactured similarly to a standard dry cell. This provides more concentrated energy in each cell and improved quality assurance. The 18” step through frame makes it easy to get on and off and is popular with both men and women, whilst the comfortable swept back handle bars and riding position enable a relaxed ride. There is a choice of three levels of electric power assistance. The pedal assist can be switched off, so you can ride as a normal bike but still have the option of the throttle for instant power. The six Shimano gears ensure the rider can assist the power when needed, either to climb a hill or to reduce the effort to prevent you perspiring. The 250watt motor (the maximum allowed for UK road) is powered by a 36 volt 10Ah battery with a range of 25 -30 miles on medium power pedal assist. The optional16 Ah battery will give a range of 45 – 50 miles. Batteries can be charged on the bike or unlocked and removed. The saddles tilt to enable easy removal of the battery. Full length mudguards, and full chain guard keep the rider clean. The handlebars are adjustable for height and reach which combine with Topgun front suspension forks to give you a comfortable ride. 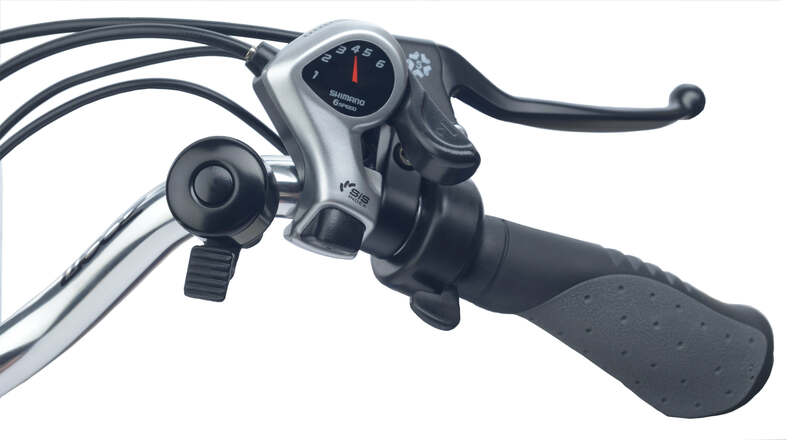 The brake levers are fitted with sensors which cut the motor as soon as the lever is pulled so you never brake against the motor power. Double wall aluminium wheel rims and 26” X 1.75” road tyres give a good combination traction on the road and long range by reducing friction on the road . The quality, power and reliability make the Hunter ideal for general road use. The batteries have a two year qualified guarantee. 90% capacity after 12 months and 75% capacity after 24 months. The right is reserved to inspect the battery for signs of neglect, lack of use, misuse or immersion in water. All other components are guaranteed for a year. Cosumable items such as brake pads and tyres are not covered unless of faulty construction. EN15191 and EN14764 test certificate of Conformity available for this bike, as required by the Spanish Authorities. To be legal in the EU the throttle should be disabled. I love my Hunter bike. It gives me the freedom to go anywhere I want.I feel very safe and in control on it. Buy one!!!! !